Does the Moon Have Levitating Lunar Dust? An artist's illustration of NASA's Lunar Atmosphere and Dust Environment Explorer mission (LADEE). Did you hear about the new restaurant on the moon? Great food, but no atmosphere. While that wisecrack has been floating about in space circles for decades, a NASA lunar orbiter will gather detailed information about the moon's atmosphere next year, including conditions near its surface and environmental influences on lunar dust. NASA's Lunar Atmosphere and Dust Environment Explorer (LADEE) is to depart the Earth for the moon in August 2013. LADEE is loaded with science gear, including instruments that can address a lingering question that's rooted in space history: Are electrostatically lofted lunar dust particles present within the moon's tenuous atmosphere? This photo of a low-level Lunar Horizon Glow was observed by NASA Surveyor 7 lander in 1968. The white streaks are glows observed at different times. In addition, some have floated the theory that the glowing transient lunar phenomenon seen from Earth might stem from sunlight reflecting off of suspended lunar dust. LADEE will investigate this moon magic trick of levitating lunar dust. The spacecraft has the tools it needs to address mysteries and questions that have been around since Apollo, said Rick Elphic, LADEE project scientist at NASA’s Ames Research Center in Mountain View, Calif.
Ames is responsible for managing the mission, building the spacecraft and performing mission operations. 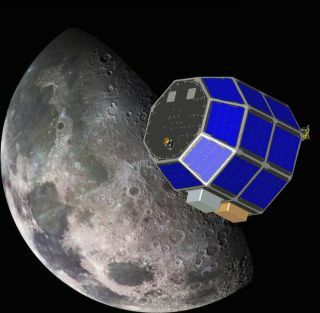 Elphic told SPACE.com that among its duties, the LADEE mission can further investigate tantalizing hints about the dust and the moon’s exotic atmosphere. "If we fly LADEE through the regions where the Apollo command module observations were made, we will know right away if there are small grains there or not," Elphic said. LADEE’s Lunar Dust Experiment (LDEX) is a very sensitive dust-detecting instrument, he said, and scientists may be able to place new upper limits on the dust in the first week of the spacecraft’s orbiting operations. "If LADEE never sees levitated dust, that settles the question for the high-altitude observations, at least for its mission time frame," Elphic said. Still, there’s the nagging question about what Surveyor saw, the near-surface horizon glow. "That might be something else entirely, and can only be addressed with a surface mission," Elphic said. "If LADEE does see dust, we will then have a basis for expecting the same phenomena at all other ‘nearly-airless’ bodies around the solar system," Elphic added. This dust may not pose much of a hazard, Elphic added, but the physics will need to be explained. Right now, no one has a good end-to-end model for getting dust to loft and secondly, stay suspended for long periods, he said. "If LADEE observes levitated dust, then scientists will have to explain it. Right now, no one can," Elphic said. Sketch of the lunar sunrise seen from orbit by Apollo 17 moon landing commander Eugene Cernan in 1972. One scientist ready for the new data to be gleaned by LADEE is Harrison "Jack" Schmitt, Apollo 17 moonwalker and geologist. He and astronaut Eugene Cernan walked the lunar surface in December 1972 — the last mission of the Apollo moon landings. "I do not know if LADEE will see lunar dust in the lunar atmosphere, but I will not be surprised if there is none," Schmitt told SPACE.com. "We know about several transient gases in that atmosphere, and these may be what causes the horizon glow at sunrise and sunset." Moon dust, Schmitt added, was always been on his mind. "My concern about levitated dust has always been that levitation, if it occurs at all, probably has to be a one-way trip off the moon … because many flat rock surfaces are essentially free of very fine dust, as I personally witnessed on Apollo 17." Schmitt said that if dust has been levitated and then dropped again, he would expect the rock surfaces to be covered with such dust. "Nonetheless, LADEE data on this question, as well as various gases, should give us a lot to think about," Schmitt said.